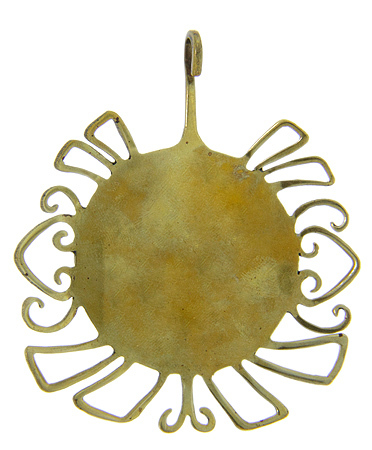 An antique button is the basis for this original one-of-a-kind designer pendant. 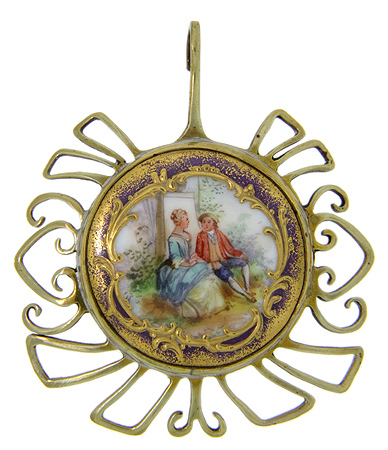 The late 18th to early 19th century button captures a romantic couple seated on a bench. The porcelain enamel is finely painted in the French rococo manner. Solid brass hand sawn pierced open work swirls and flourishes serve to frame the button. The piece measures 2 1/2" wide, 1/2” deep and 3” tall including the bail. Design by Marlene Harris.